zero-one wrote: Well for one, we know the F-35 circulates fuel to reduce it's IR signature, what if the Raptor has that system too or a similar system, maybe even a more effective one. This is an F-22 on the ground with engine off, also who dogfight without afterburner? zero-one wrote: another theory I have is. Just because you can see the F-22 in an IR video, that doesn't mean the missile can see it too. The F-22 may look like a flare for these missiles. Yes it was simple, his weapons coudn't lock on even if he could see the [expletive] thing. The words "even if" were key. That means he expected a lock but couldn't get it. He wouldn't expect it if he was out of weapons parameters in the first place. -IR stealth system may also be off. -This picture would actually suggest that the F-22 has no IR stealth at all. garrya wrote: also who dogfight without afterburner? Tailgate said it perfectly, dogfights are quick, he tries to end it in under 60 seconds. If you watch the Aim-9X demo. there was a point where it showed you the seeker's point of view. At first, the target QF-4 looks just like a white blob in the sky. the shape isn't recognizable. it wasn't until the missile came extremely close to the F-4 that the shape of the aircraft became recognizable. Last edited by zero-one on 28 Nov 2018, 07:49, edited 3 times in total. Thankyou for your insights sir. Basically the debate is around the statements of Mr Campbell and yourself where the Aim-9X supported by HMCS had a hard time achieving a lock on the F-22. For me, the statements were clear, the F-22's IR reduction gives it a level of stealth at close range against IR weapons to a degree. Not something that you would bank on but at least it gives you some margin of protection. If the Raptor can do this at short range, then the implications of this IR stealth at long range will be immense. These missiles are programmed to lock on to target images which make them very resistant to flares. Sure flares can increase survivability and can make locking the seeker head more problematic if enough of flares are launched at the right time to mask the target from the seeker (for a short time period). F-22 will definitely not look like a flare to a IIR seeker as it's definitely much larger and cooler than flares. IR signature reduction would make the masking effect work better just like RCS reduction will make EW work better. Smaller signature is always easier to hide than larger signature. zero-one wrote: If you watch the Aim-9X demo. there was a point where it showed you the seeker's point of view. Sure at longer ranges a target would look like a white blob in the sky because it covers very small number of pixels. But at such ranges the flares would also have little effect to seeker as the flares would be within those same pixels. At closer ranges the flares can be separated from target image using image recognition techniques because they fill a lot more pixels by then. Of course flares are also much hotter than target and because IIR seeker can see the temperature of each object (or actually pixel) in the image, differentiating flares from target is pretty simple. This is one reason why modern countermeasures dispensers have a lot of flares compared to earlier ones. Sure at longer ranges a target would look like a white blob in the sky because it covers very small number of pixels..
Well it wasn't a dot or anything. It took about three second from the point you could clearly make out the shape of the QF-4 in the seeker and when the missile hit it on a perpendicular path. At mach 2.5 that would be at around 2.5km distance when it was not longer a blob. 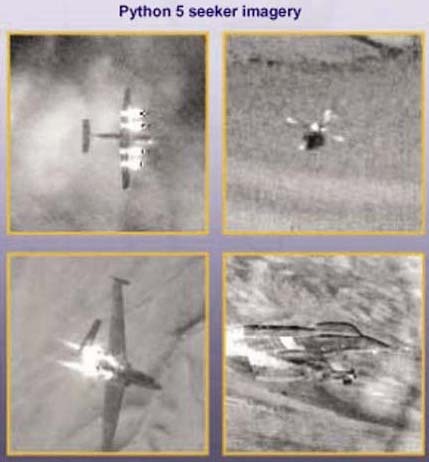 With high-dynamic-range imaging techniques you can even get a sharper image by combining image frames, I do not know however if the AIM-9X uses such techniques. botsing wrote: Define "extremely close". definitely within visual range. within the 5 km WVR bubble. Anyway, I was thinking that when the missile is still attached to the launching aircraft, this is probably how it sees its targets. Now if that target is an F-22 or F-35, I imagine that blob to be a lot smaller. Harder to lock on to. zero-one wrote: Now if that target is an F-22 or F-35, I imagine that blob to be a lot smaller. Harder to lock on to. The blob size for the F-22 and F-35 at that distance will be their relative size compared to the QF-4, so not much different. IIR targeting will succeed at targeting the stealth jets too at that same distance, weather conditions and angle. The advantage for the stealth jets is in their lower contrast that will result in a more favorable signal to noise ratio and thus a more favorable and closer distance at which the stealth jets can be detected/seperated from the noise. They will also be harder to detect in a more noisy environment like adverse weather or a more variable background. Once you cross the detection line however the IIR will home in on the shape of the stealth jets just the same. I think botsing has it right here. zero-one wrote: Yes it was simple, his weapons coudn't lock on even if he could see the [expletive] thing. The words "even if" were key. That means he expected a lock but couldn't get it. He wouldn't expect it if he was out of weapons parameters in the first place. zero-one wrote: -IR stealth system may also be off. So you are suggesting an F-22 with engine off will be hotter than a flying F-22 with IR suppression system? zero-one wrote: Tailgate said it perfectly, dogfights are quick, he tries to end it in under 60 seconds. If he want to finish dogfight quick, he will use all advantage he has, and Afterburner is a very important part of that. He will only conserve the use of afterburner if he wants to prolong the fight instead. It's pretty much worthless throwing up IR images of aircraft without knowing the range and conditions when that image was taken. F-22 and F-35 have IR signature reduction measures of unknown type and effectiveness. Seekers on IR guided missiles are less capable than those of IRST targeting systems, due to smaller size. So it is entirely possible that even if a F-22/35 could be clearly imaged with an IRST, an IR guided missile would still be unable to gain a lock, and in the exact same circumstances a lock would have be made against a 4th gen aircraft. Also, the imaging system on an AIM-9X is going to be an early 2000s vintage. It will also be smaller than the handhelds used at airshows. So, a smaller and older system cannot be compared with airshow images. If you want to have any meaningful discussion on IR reductions, look at IIR images of the F-22 vs another fighter. The differences I've seen in F-22 vs Su-35 are astounding. F-22 in AB looks similar to the Su-35 in Mil. The Su-35 in AB looks like it might as well be a Saturn V.
sprstdlyscottsmn wrote: Also, the imaging system on an AIM-9X is going to be an early 2000s vintage. It will also be smaller than the handhelds used at airshows. So, a smaller and older system cannot be compared with airshow images. If you want to have any meaningful discussion on IR reductions, look at IIR images of the F-22 vs another fighter. The differences I've seen in F-22 vs Su-35 are astounding. F-22 in AB looks similar to the Su-35 in Mil. The Su-35 in AB looks like it might as well be a Saturn V.
Sounds indeed logical. And a Saturn V seems to have a hell of a IR signature. Do you have a link for the images comparison F-22 vs Su-35? Either the Su-35 has a visibly invisible afterburner in those conditions or it's Mil plume looks like the AB plume of the Raptor. Also, the Su-35 in the pattern has a similar plume to the F-22 in Mil.